Re-entering into everyday life after returning from my recent meditation retreat, I was pretty confident that I had this whole Dhamma thing worked out. Impermanence – check. Suffering – check. Non-self – oh, yeah, a big checkorooni. I carried the lessons I’d received on retreat in the backpack of my being for handy reference. Any emotions that arose were examined and dismissed with a surety of compassion and equanimity that felt hinged to my cells. My meditations on illness, death, aging and loss were vivid and focused. Loving kindness pervaded every waking breath. Then I got a cold. It’s funny how clear and mindful one can be when illness is a thought playing in your head vs. the sensory experience of snot dripping from your nose, your head feeling like a Zeppelin, and your body aching so much from relentless fits of hacking that you’re sure you’ve just coughed up a portion of your lung. Checking in with myself a week ago as to how I was feeling, I’d hear “Joy”, “Tranquility”, “Peace”. Now I heard a surly adolescent grunt “Miserable”. Okay. You have to start somewhere. With my throat raw and sore, I felt guilt about missing work and guilt about wanting to miss work. When I couldn’t sleep because I couldn’t breathe, I felt sadness that I wouldn’t get to spend time this weekend with my friends visiting from out of town. As I sat at the computer and considered writing, exhaustion swooped in like a vulture and carried my best intentions into the stratosphere of a rain-filled sky. Yes, this is just a cold, and as I’ve found over the last four days, finding serenity through discomfort can be quite a challenge. I’ve done it before in meditation when pain showed up in my back, my legs, my hips. I could look at that pain, sit down next to it and not get lost in its appearance in my body. Those times, however, the discomfort pretty much disappeared when I got up from the cushion. My current ailment has proven to be a bit more difficult since my cold symptoms actually lessen when I meditate. It’s stepping off the seat of enlightenment where I stumble back into body or form, feelings, perceptions, thoughts, consciousness, in Buddhism called the Five Aggregates. 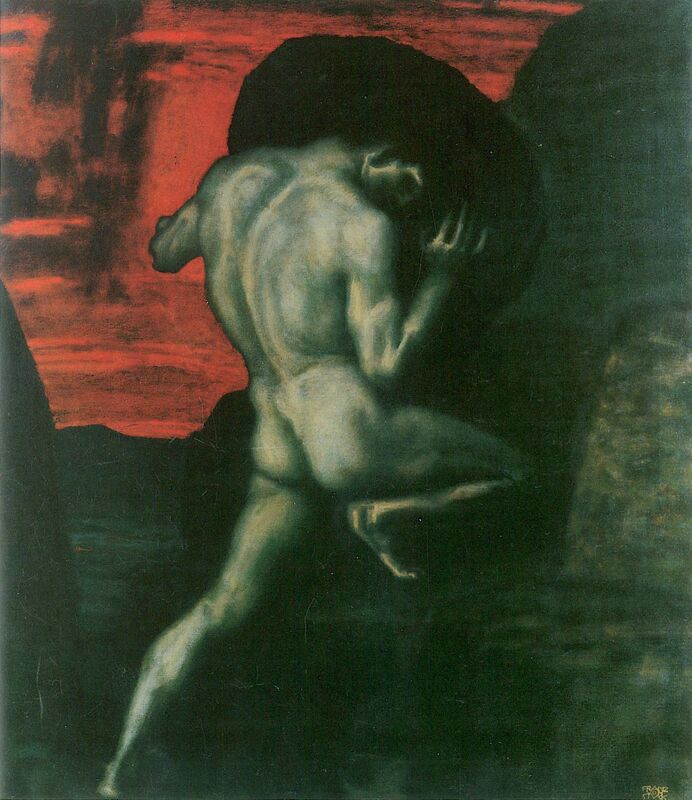 Looking at the lessons of the Dhamma over the last few days, I feel in some ways like Sisyphus staring at his rock at the bottom of the great mountain. Again. The sensory discomforts, the swirling feelings, perceptions ranging from clear mindfulness to viewing myself as through a window, gazing in at this tortured bag of sea water. My thoughts have been focused and at other times like pinballs rattling around in the machinery of my clogged consciousness. I see clearly the impermanence of my illness, but what if I had a chronic condition or some disease that would terminate in my death? Making peace with the mere elements of me and seeing them as just skin and flesh, bones and phlegm, there’s a permission granted not to hold on so indelibly to the outcome of anything. In setting aside the attachment to my stuffed up nose and my annoying cough I can sit down next to them with compassion and not be pulled into misery and suffering. By seeing the parts of my body with casual attention I can remove them from my experience of a self and step into a place of serene loving kindness for this beautiful, snotty body. What a gift this cold has been. Admittedly I’m feeling better symptom wise so my reflections on joy and loving kindness may have more to do with my less foggy head, but I know last night as I slept, whenever I did wake up, I reminded myself of serenity and smiled as I followed my breath back to sleep. I feel joy in the light reaching through the clearing clouds and contentment in pushing the rock of effort towards a clearer way of being, not just when my air passages are clear, but in every moment until my last glorious exhale of this life. There is no ground control, no one to guide us on the Dhamma path except ourselves. The road is laden with colds and wrinkles and waking up to the truth that each moment is breaking new ground on our journey. And just when you think your feet know where they’re headed, put your helmet on and prepare for a tumble back down that mountain. When you land flat on your back to begin the quest yet again, remember to stay there awhile and smile up at the sun and the moon and the billions of laughing, radiant, stars gone by. On being sick you wrote “I felt guilt about missing work and guilt about wanting to miss work.”. Same here. Thank you for your post. Thanks for writing, Nicole, and for making me smile. Ah yes, lovely, niggley guilt. May it pass us both by in very short order. Be Well (so many layers!) Dear Tess!